Check that the indicator on the engine switch is illuminated in amber and then press the engine switch once. Check that the indicator on the engine switch is off. Auto power off function If the vehicle is left in ACCESSORY mode for more than 20 minutes or IGNITION ON mode (the engine is not running) for more than an hour with the shift lever in P, the engine switch will automatically turn off. However, this function cannot entirely prevent battery discharge. Do not leave the vehicle with the engine switch in ACCESSORY or IGNITION ON mode for long periods of time when the engine is not running. 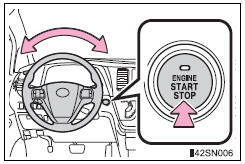 After turning the engine switch off and opening and closing the doors, the steering wheel will be locked due to the steering lock function. Operating the engine switch again automatically cancels the steering lock. The green indicator light on the engine switch will flash and a message will be shown on the multi-information display. Press the engine switch while turning the steering wheel left and right. To prevent the steering lock motor from overheating, the motor may be suspended if the engine is turned on and off repeatedly in a short period of time. In this case, refrain from operating the engine. After about 10 seconds, the steering lock motor will resume functioning. If the vehicle begins to slide due to engine failure or other circumstances, do not lock or open the doors until the vehicle reaches a safe and complete stop. Activation of the steering lock in this circumstance may lead to an accident, resulting in death or serious injury. If the indicator on the engine switch is illuminated, the engine switch is not off. When exiting the vehicle, always check that the engine switch is off. If the engine switch seems to be operating somewhat differently than usual, such as the switch sticking slightly, there may be a malfunction.